I hurt my shoulder…playing tennis on a Wii. This experience made me ponder how the concept of immersive virtual reality evolved over time. Ever since the novels such as Neal Stephenson’s Snow Crash or Michael Crichton’s Disclosure, we have had the idea of what virtual reality should be like. It is this cool place where people can do virtually everything and that is way better than the real reality because it was designed by programmers. Since then, we are trying to build such immersive virtual reality in the non-fiction world. Virtual reality has come a long way from the first oh-so-slender-looking avatars in Yahoo’s Instant Messenger. Second Life became the rage a couple of years ago, allowing our still oh-so-slender avatars to attend product announcements, fly through the cyberspace and flirt with strangers. Second Life has since lost a bit of its luster – at least for now. Frankly, the flying and flirting via mouse clicks wasn’t all that immersive and got pretty boring after a while. So far, Second Life is falling short of the promise of Stephenson’s metaverse. There are actually some useful applications for virtual reality today – from home decoration and landscaping, all the way to production line design. I saw once a very cool virtual reality application for chemical facilities that enabled the repair crew to analyze best path of access and determine needed equipment in case of a breakdown. But these applications are more focused on modeling the reality rather than the human experience in it – they are not particularly immersive. By the way, Wikipedia offers several good ways of categorizing immersive virtual reality. I am really excited by the new types of immersive virtual reality applications that combine the cognitive immersion with sensory-motoric immersion, and sometimes even the emotional immersion (to use the Björk/Holopainen categorization). Here, the experience on screen is combined with actual physical activity. Driving and flight simulators were the first of such applications. If you want to see how immersive they can be today, check out the Cyber Speedway at the Sahara Hotel in Las Vegas. 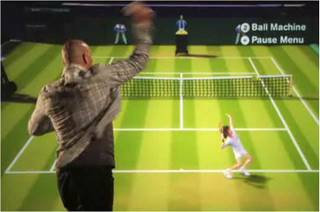 Playing tennis on a Wii is a similar kind of immersive virtual reality. This kind of immersion provides a pretty decent physical experience of the activity. OK, the experience might be still lacking the G forces or the sliding stops but that’s perhaps only a temporary limitation. The highly acclaimed Microsoft’s Wave (aka Project Natal) is the next step in this direction. What’s exciting about the immersive virtual reality is the fact that it offers a more realistic experience than just clicking buttons while staring at a screen. It allows us to actually do things – develop and improve our skills through practice that would otherwise be restricted by physical limitations. And that’s way more engaging than flying through Second Life. But now it’s time for me to rest my shoulder while I practice piano on my iPad. Or perhaps a round of golf on Wii? 2. 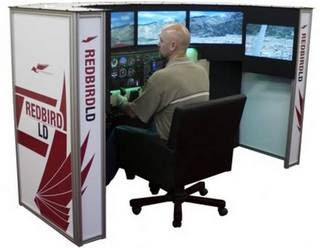 Professional grade offering by RedBird Flight Simulations, Inc.